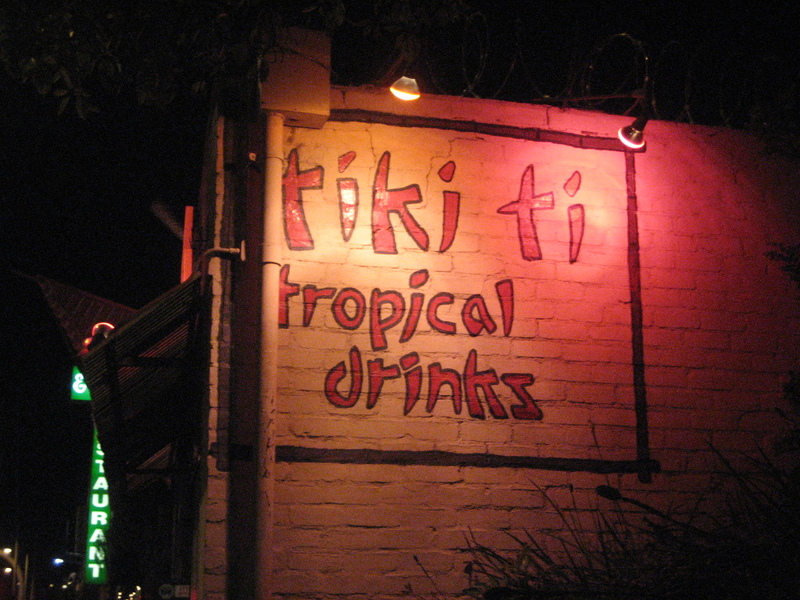 Tiki-Ti, Los Angeles – If you visit only one tiki bar in LA it should be the Tiki-Ti — bring cash and order a Ray’s Mistake. It’s on my list of the Top Tiki Bars in America. Pacific Seas at Clifton’s, Downtown LA – Brand new entrant to the tiki scene, with the most elaborate decor in town. 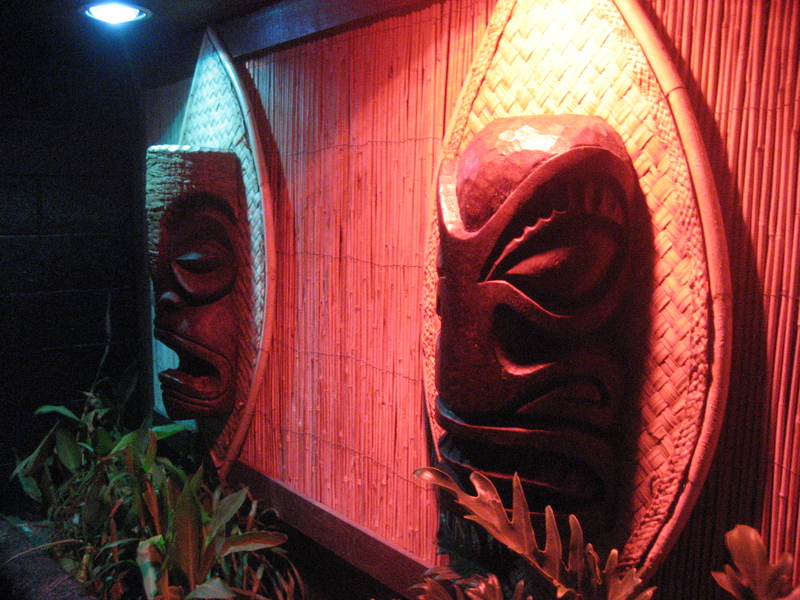 Tiki No, North Hollywood – NoHo tiki bar with topnotch decor, a young-ish crowd and improved drinks. Tonga Hut, North Hollywood: A remodel a few years ago gave a midcentury modern makeover to the oldest still-operating tiki bar in LA. Damon’s, Glendale: Over time, this decades-old steakhouse transformed into a cozy den of tiki decor — with terrific steaks. 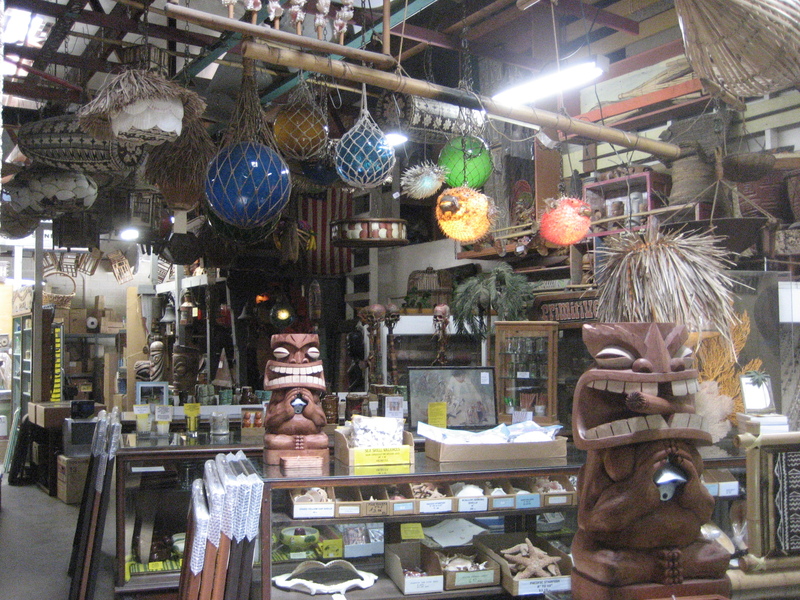 Oceanic Arts, Whittier – Legendary warehouse with everything you might need to decorate your own tiki bar or throw an epic luau. Wacko, Los Angeles – A kitschy wonderland filled with art books, Tiki Farm mugs, Shag prints and retro toys that’s also home to La Luz de Jesus gallery. Home With The Beachcomber Store, Simi Valley – If you didn’t bring back enough souvenir gifts for people after your Hawaiian vacation, you can stock up on Hilo Hattie-type Aloha wear, Kona coffee, and chocolate covered macadamia nuts. Mission Tiki Drive-In Movie Theatre, Montclair – One of the few remaining drive-in theatres in Southern California also happens to be tiki-themed! Tiki Night at the Egyptian Theatre – Every summer the Egyptian Theatre in Hollywood hosts a luau in the courtyard followed by a tiki-related film screening. 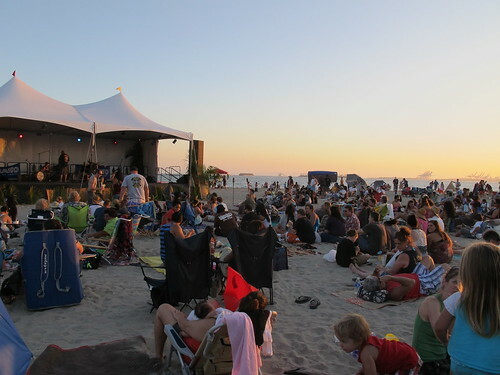 Tiki Festival Long Beach – A weekend with tiki carvers, Hawaiian food stands and Polynesian dancing and music performances on the beach, capped off with fire knife dancers. Tiki-ish Drinks & Hawaiian Fare at A-Frame in Los Angeles – Chef Roy Choi’s restaurant is now serving up house-made Spam, tiki-inspired cocktails and more. Tiki-fied El Camino at the Burbank Car Classic – This gorgeous 1959 Chevrolet El Camino was tricked out with tikis, lauhala matting and bamboo. City of Downey’s 2012 Rose Parade Float – For the 2012 Rose Parade, the City of Downey created an “Enchanted Paradise” float with tikis, a bamboo hut and a volcano waterslide that also erupted real fire. 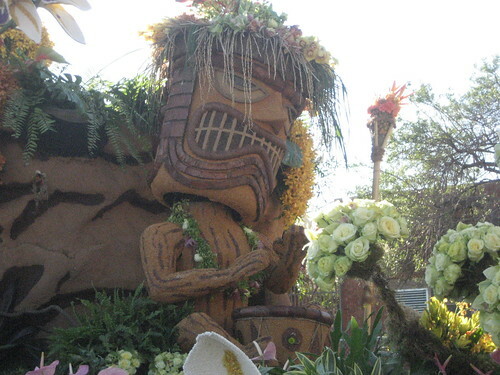 L.A. County Fair – Somehow I always stumble on something tiki-related at the annual L.A. County Fair. Blue Hawaiian Cupcakes – Yummy Cupcakes has a roster of more than 200 flavors, and every month they feature rotating daily specials. Their cocktail-inspired offerings include Mai Tai, Pina Colada and Blue Hawaiian. A night at Bahooka was like having dinner in Davy Jones’ locker. Bahooka, Rosemead – This nautical restaurant dished up ribs and fried fare, but the real star was a big carrot-eating fish in one of the hundreds of aquariums. Bahooka closed in March 2013. Luau, Beverly Hills – This recent tribute to Stephen Crane’s Luau lasted less than a year. The Beachcomber Cafe at Malibu Pier – There’s still The Beachcomber Cafe in Orange County, but I’ll still miss the Tonga Lei Room (see below). 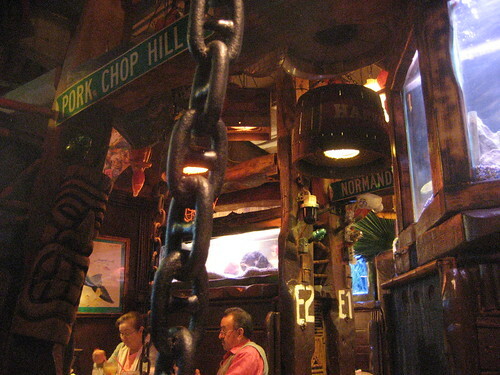 The Tonga Lei Room at The Beachcomber, Malibu – A tiny dining room that packed a big tiki punch. Trader Vic’s, Los Angeles – The famous chain of tiki restaurants launched a new generation of mostly ill-fated locations, including this one downtown at LA Live that closed in March 2014. I’d like to invite you to our Tiki Nights. We’re just getting started but have had guest bartenders from all over Long Beach and OC join us for delicious Tiki drinks once a month in our Cocktail Bar known as the Exhibition Room. Please, we would love for you to join us.